The Si5351A is a relatively recent clock-generator chip manufactured by SiLabs. It can produce three simultaneous independent 50-ohm impedance, squarewave outputs between 8kHz and 160MHz. Configuration of the chip is via a microcontroller with I2C (two-wire) interface. 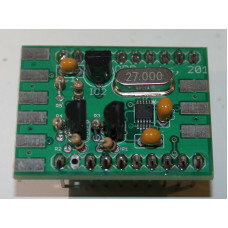 This Si5351A synthesiser module kit (or "breakout board") runs from a 5V or 3.3V supply. The tiny 0.5mm pin-spaced Si5351A chip is pre-soldered to the PCB at the factory. The PCB size is 1.3 x 1 inches (33 x 25mm). The remaining components are all through-hole components so construction is easy. The circuit contains a 3.3V regulator and I2C level converters, for use with 5V microcontroller systems. The kit may also be built without the level converters or regulator, for use in 3.3V systems. The kit has a 2 x 10-pin 0.1-inch header for all connections. Additionally pads are provided on the PCB for soldering SMA connectors if you wish. The kit uses a 27MHz crystal as the reference oscillator. CLICK HERE to download assembly instructions and for further information.